Mid-week market update: About two weeks ago, I wrote a post indicating that market had focused on the positives of a Trump presidency (see The Trump Presidency: A glass half-full?). Now it seems that market psychology is subtly shifting to a glass half-empty view. Good morning. Just wanted to check in briefly to voice my approval for the Treasury Secretary and Commerce Secretary picks announced by the Trump transition team this morning. They’re both highly accomplished and capable people who’ve held senior roles within businesses, even if they don’t have government experience. To my knowledge, neither is looking to eject homosexuals, Jews or brown people from the country, so that’s a step in the right direction. I don’t believe that either has an agenda against women or takes money directly from Russian banks or posts frog memes on Twitter. Neither pick is a sitcom star from the 1980’s or one of the President-Elect’s children. The hourly SPX chart below tells the story of a lack of positive reaction to good news. Such market reaction points to short-term bullish exhaustion. Announcing our Black Friday/Anniversary promotion! We are making a limited number of discounted annual subscriptions available at a price of US$199.99, which is US$50 off the regular price of US$249.99, for the first year. This offer is open to the first 100 subscribers, or until December 15, 2016, whichever comes first. Click on this link to subscribe and use the code anniversary2016 at checkout to get the discount. We only have a handful of discounted annuals subscriptions left. Hurry before they're all gone! It was nine years ago today, Humble Student of the Markets was born. 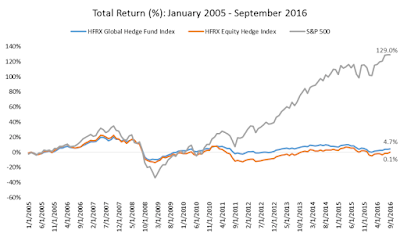 My first post at the time was entitled What exactly are hedge funds hedging? 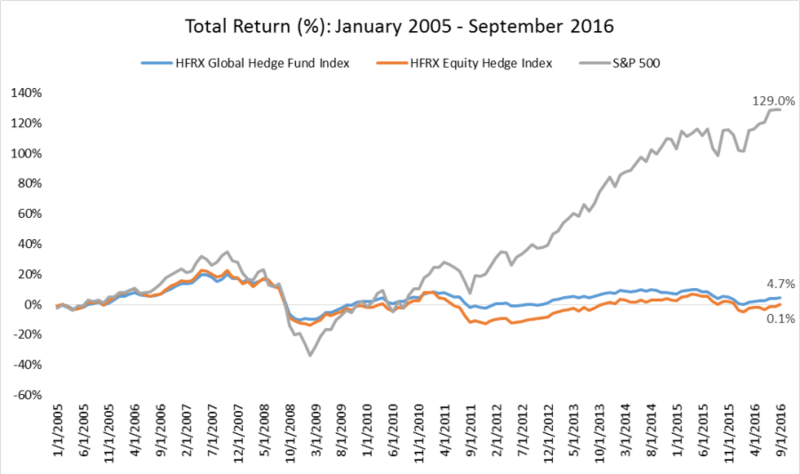 I went on to show that hedge fund returns were correlated with equity returns. That makes conceptual sense, because hedge funds are in the business of taking risk and equity risk is a major component of investing risk. Nine years later, hedge funds have done even worse than what I showed in 2007. Charlie Bilello showed that their returns have flattened out. They are no longer correlated with equity returns. It could be argued that HFs are absolute return vehicles and therefore it is unfair to compare them against equities. 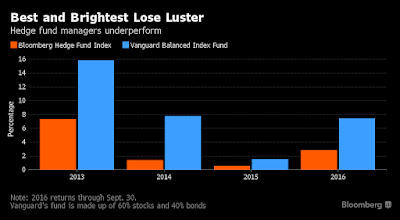 Bloomberg showed that their performance against a balanced fund benchmark has been nothing to write home about either. The market has reacted and the latest figures show that YTD hedge fund fund flows have turned negative. 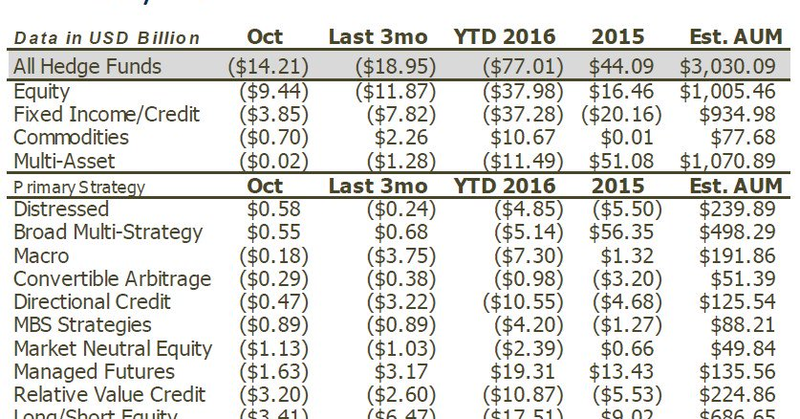 YTD redemptions are 77b as of October 2016. My assertion back in 2007 that alpha is hard to find turned out to be correct. Many HF strategies, such as convertible arbitrage, long/short equity, event-driven, emerging markets, and so on, can be approximated by combinations of factors. In other words, you were paying for beta when you thought you were buying alpha. Since then, even those beta strategies have turned into...I don't know what as aggregate HFRX Indices have flattened out over the last few years. The field is getting far too crowded to extract significant alpha. Back in the early 1990's, when swashbuckling managers like Julian Robertson and George Soros dominated the field, a billion dollar hedge fund was an enormous fund. 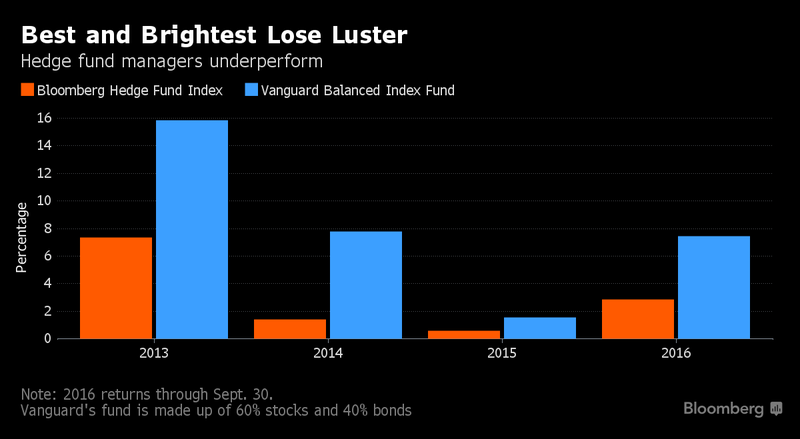 Today, a fund with AUM that size just gets lost in the crowd. I am not always right, but this is just an example of the value I have brought to the blogosphere and to the investment community. We announced the Black Friday/Anniversary promotion nine days ago. We only have a handful of discounted annual subscriptions left at a price of US$199.99, which is US$50 off the regular price of US$249.99, for the first year. This offer is open to the first 100 subscribers, or until December 15, 2016, whichever comes first. Click on this link to subscribe and use the code anniversary2016 at checkout to get the discount. The stars seem to be aligning for a revival in gold prices. Prices saw a nice bounce today as equities weakened. The trends in other asset classes, such as stocks, bonds, and the US Dollar, look very stretched in the short-term and poised to reverse. From an inter-market analyst viewpoint, gold also seems to be in that camp. The chart of gold below tells the story. Bullion prices have been falling and they are oversold on RSI-14. The violation of key support at the 1205-1210 zone has prompted high volume selling, which is indicative of investor capitulation. From a technical perspective, gold prices are now testing a Fibonacci retracement level at 1170. This seems to be a classic setup for a revival in gold prices. Not so fast! While gold prices may stage an oversold rally here, a durable bottom may not be in place just yet. Last week, perennially bullish strategist Tom Lee appeared on CNBC and stated that the Trump win could produce a major bull market. While it is true that stock prices have rallied significantly since the election, the fundamental underpinnings of the advance were not mainly attributable to Trump's win, notwithstanding the change in psychology. 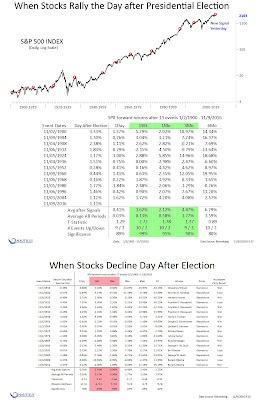 Many of the reasons for the stock market gains were already baked in before the election. Consider, for example, the better growth outlook. The chart below shows the evolution of the NY Fed's nowcast of Q4 GDP growth, which shows an upward acceleration in Q4 growth. Those factors were already in place well before the election, regardless of who won the White House. Higher inflation expectations, which leads to. Three steps and a stumble. We are somewhere between Act 2 and Act 3 of that script. Trend vs. counter-trend: Who wins? Mid-week market update: Traders who rely on technical signals use two main kinds of trading systems. They either rely on trends or counter-trend signals. Trending systems capitalizes on spotting a bandwagon and jumping on it before the crowd to ride it to profit. By contrast, counter-trends systems depend on finding market extremes and positioning for the pending reversal. The market is currently strongly trending and staged important breakout to new highs. However, it is also stretched on a number of measures and this condition is occurring in a number of asset classes. An inter-market analysis suggests that the markets are poised to either pause or correct their strong moves. The Italian referendum = Next populist domino? 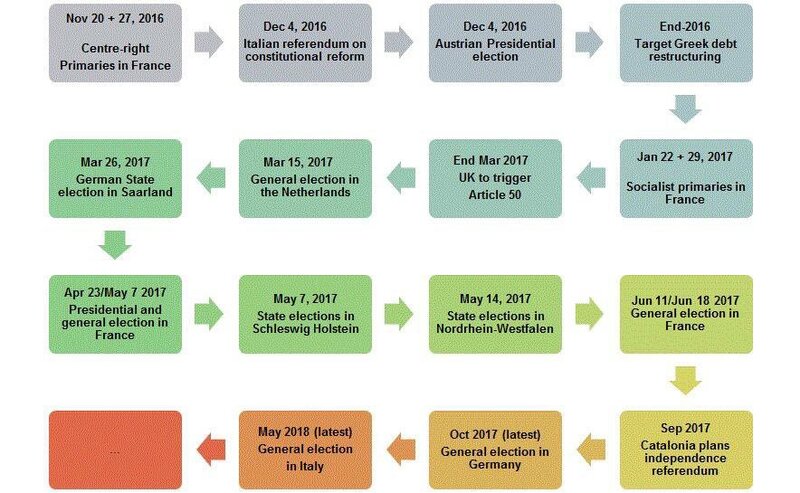 Ian Bremmer of the Eurasia Group recently tweeted the following political calendar in Europe. After the surprising Trump win, the market is closely watching for electoral surprises. 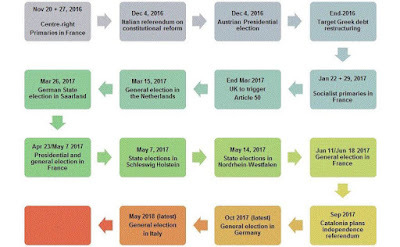 Next up is the Italian referendum on December 4, 2016, in which PM Matteo Renzi has asked for revisions to the constitution in order to break the endless cycle of deadlocked and changing governments. Italy has seen over 60 governments since the Second World War. Austria will also hold its presidential election on December 4, in which far-right candidate Norbert Hofer is leading in the polls. The results are mitigated by the largely ceremonial nature of the presidential post. The Italian referendum and Austrian vote will be followed by an election in the Netherlands, in which anti-EU Freedom Party led by Geert Wilders is leading in the polls. The French presidential election will be held in the summer, where the anti-establishment candidate Marine Le Pen is expected to poll second heading into the run-off race. Finally, Germany will hold its election in late 2017. While Brown may have gone on "recession watch" for contrarian reasons, I am on "recession watch" because of a deterioration in macro data. But don't panic. A "recession watch" is emphatically not a forecast of an impending slowdown, nor is it a forecast of an imminent bear market. Macro readings are starting to look a little wobbly and therefore some caution may be warranted. The scenario that I outlined before of a cyclical top in 2017 is playing itself out (see Roadmap to a 2017 market top). The chart below shows Goldman Sachs' depiction of US recession risk. While I don`t necessarily agree with Goldman`s probability estimates, I do agree that risks are rising but they are not at levels that warrant a full-scale defensive portfolio position (annotations in red are mine). This week, I would like to expand on the threats that faces the US and global economies, and by implication the stock market. I would further point out that the data began to deteriorate before the election and my change in view has little to do with the electoral results. Only one of the Trump proposals have an unexpected side-effect of exacerbating the downside vulnerability of the global economy in a downturn, but that effect is relatively minor. 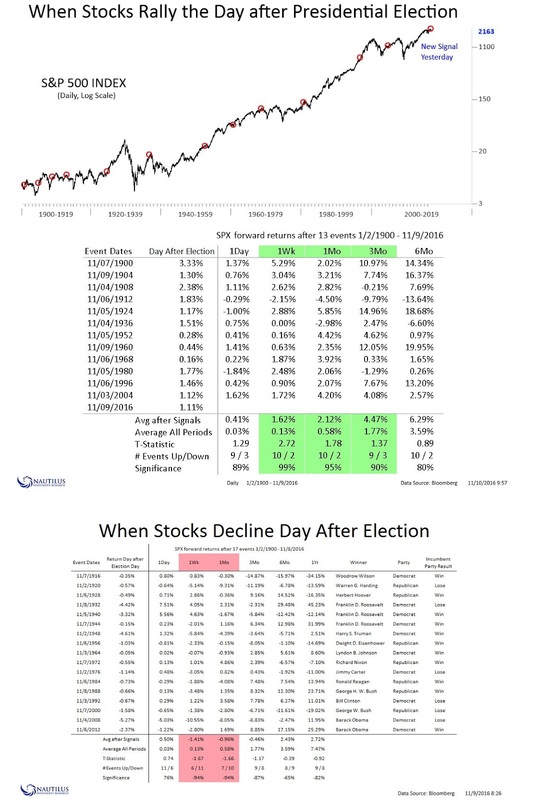 I have been seeing analysis from various quarters raising concerns about the sustainability of the post-election stock market advance because of the poor breadth of the market. The chart below shows the NYSE A-D Line overlaid on top of the SP 500. As you can see from the chart, the NYSE A-D Line has been lagging even as the market advanced. 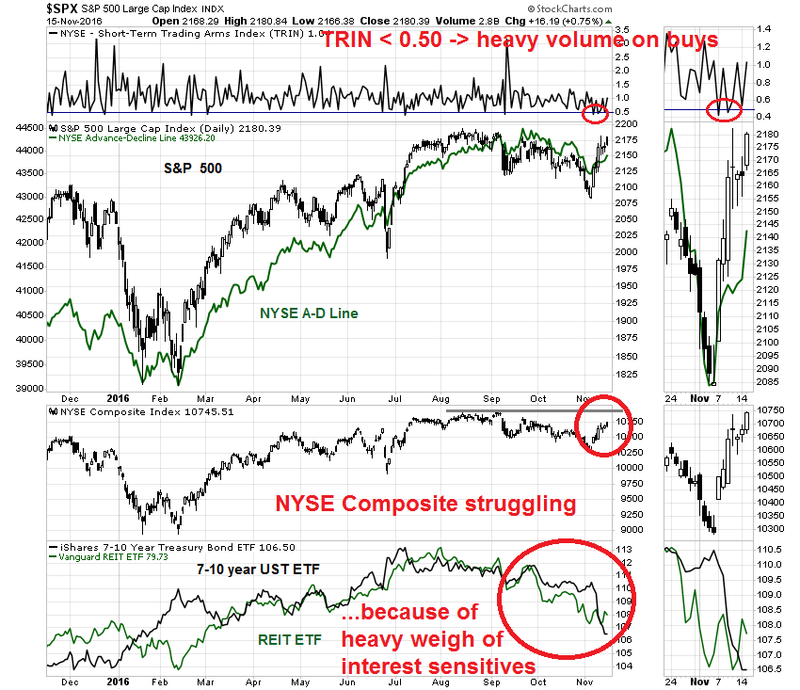 If the generals (large caps) are leading the charge, but the troops (breadth) are not following, then such divergences are thought to be warning signs that the move may not be sustainable. I would not be so worried about that. The NYSE Composite is made up of many closed-end bond funds and REITs which have dragged down the performance of that index. We can see a hint of that effect in TRIN (top panel). 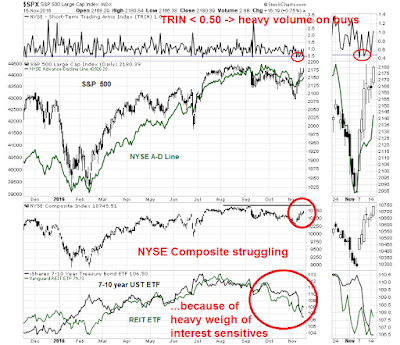 There were two days in the post-election rally when TRIN fell below 0.50, which is an indication that advancing volume was running well ahead of advancing issues. That`s because many of the declining issues were relatively thinly traded interest sensitive bond funds and REITs. While I am not worried about a negative breadth divergence, the sudden turnaround in bullish sentiment is a concern to me. 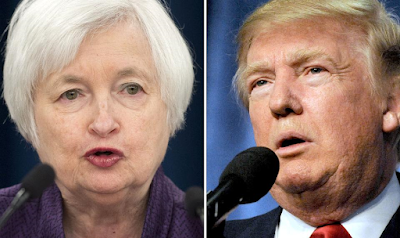 Trump vs. the Fed: War or détente? In many ways, Donald Trump is an economic enigma. Candidate Trump has in the past advocated wildly contradictory positions on the campaign trail. Sometime the market is left not knowing what to think. One little discussed topic but important topic is Trump's relationship with the Federal Reserve. What kind of Fed would he like to see? An easy monetary policy helped the incumbent party by stimulating growth. When he becomes President Trump in January, does he still want the Fed to take a more hawkish approach to monetary policy? It would be too easy to get into an impotent rage should your favored candidate lose, or if policy doesn't go in your desired direction. That kind of thinking clouds judgment and leads to subpar investment results. 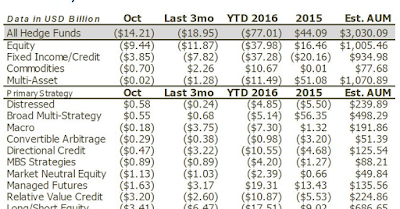 The stock market embraced the reflation investment thesis that I have been writing about for several months, except this time it`s reflation on steroids (also see Super Tuesday special: How President Trump could spark a market blow-off). As there are many blanks that still to get filled in about the new administration, it's important to be aware of the bull case and bear case for stocks. Mid-week market update: Today's market action should be a lesson to me to change model rankings based on overnight futures prices, which trades in a thin and volatile market (see What now?). To set the record straight, the Trend Model did not move to a neutral, or risk-off reading based on today's market action. The change last night was based on ES futures falling 3-4% at the time of writing. One common refrain made by politicians who concede elections is, "The people have spoken!" In this case, the market has spoken and it has decided to adopt the bullish view that Trump is a reflationary president, rather than the bearish view of Trump the protectionist. This interpretation was made evident by the rally in the cyclically sensitive industrial metals, even as gold prices fell. From a technical viewpoint, the stock market's behavior is showing a path to an uber-bullish outcome. 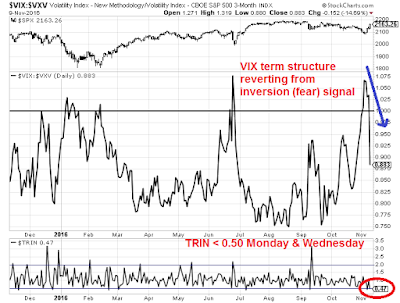 As the chart below shows, the market is showing the combination of a fear unwind, indicated by the normalization of the VIX term structure from an inverted state, and two days where TRIN has dipped below 0.50, which is a signal of a buying stampede. As I write these words, there is pandemonium in the markets. ES futures are down about 4%. My 16 year-old (Canadian) daughter received an offer of marriage over the internet from an American. I recognize that a lot of people view a Trump presidency with horror, but it's time to assess the investment implications of these electoral results. Arguably, fear levels have already spiked and any panic selling could be viewed as a buying opportunity for stocks. 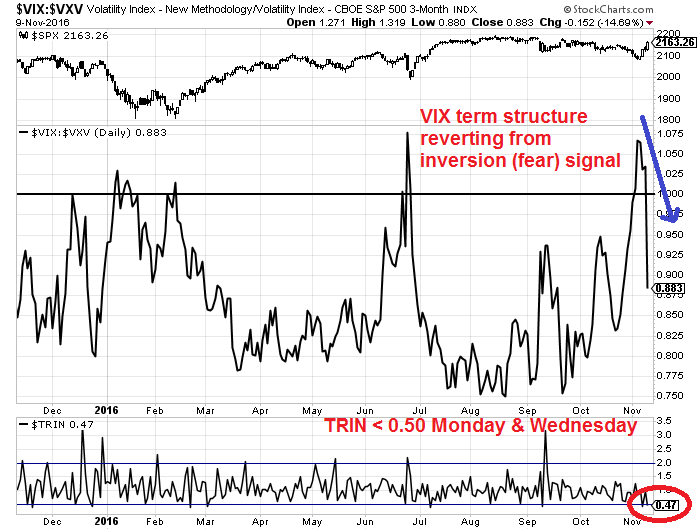 As the chart below shows, the CBOE put/call ratio (middle panel) spiked to 1.48 yesterday and the VIX term structure inverted. These are readings consistent with short-term bottoms rather than the start of a sustained bear leg. So let's take a deep breath and review the bull and bear case for equities under a Trump administration. I got a few questions about an apparent contradiction in my last post (see Don't be fooled, Election 2016 isn't the Brexit referendum). I had highlighted a Mark Hulbert article indicating that former Value Line researcher director Sam Eisenstadt had a SPX target of 2270 to 2310 by April 2017. Market timers use the VLMAP to project where the stock market will be in four years, the midpoint of the analysts’ three-to-five-year horizon. The VLMAP is currently at one of its lowest levels in years—as low, in fact, as it stood at the top of the bull market in October 2007, right before the worst bear market in the U.S. since the Great Depression. Value Line itself does not recommend using the VLMAP as a market-timing tool, even though the firm is not against anyone using it or any of the other data it produces. As far as I can tell, the VLMAP-based market-timing model originates in work done in the 1970s and 1980s by Daniel Seiver, a member of the economics faculty at California Polytechnic State University and editor of an investment advisory service called the PAD System Report. It’s worth noting that a casual reader of the Value Line Investment Survey wouldn’t immediately become alarmed upon viewing the latest VLMAP reading. It stands at 40%, which over four years is the equivalent to an annualized return of 8.8%. As Eisenstadt had been the long serving research director of Value Line until 2009, how can investors reconcile these apparent contradictory bullish and bearish views based on similar data. Which interpretation of Value Line data should we believe? I have some terrible news to report. As a result of the change from Daylight Savings to Standard Time this weekend, the entire world will have to endure the US election for an extra hour. All kidding aside, I could see the market anxiety rising all of last week. It wasn't just the market action, which had taken on an increasingly risk-off tone as the week went on. It wasn't the rising bearishness on social media. The biggest indicator of concerns over electoral uncertainty occurred when I saw that the traffic on my last post (see Trading the Trump Tantrum) was roughly triple the usual rate. Despite some half-hearted rally attempts, the SPX ended the week testing its 200 day moving average (dma), and oversold on a number of key metrics. Traders are treating next week's US election as the same kind of market moving event as the Brexit referendum. There is one key difference. The market was relatively sanguine going into the UK vote and expected a favorable outcome. 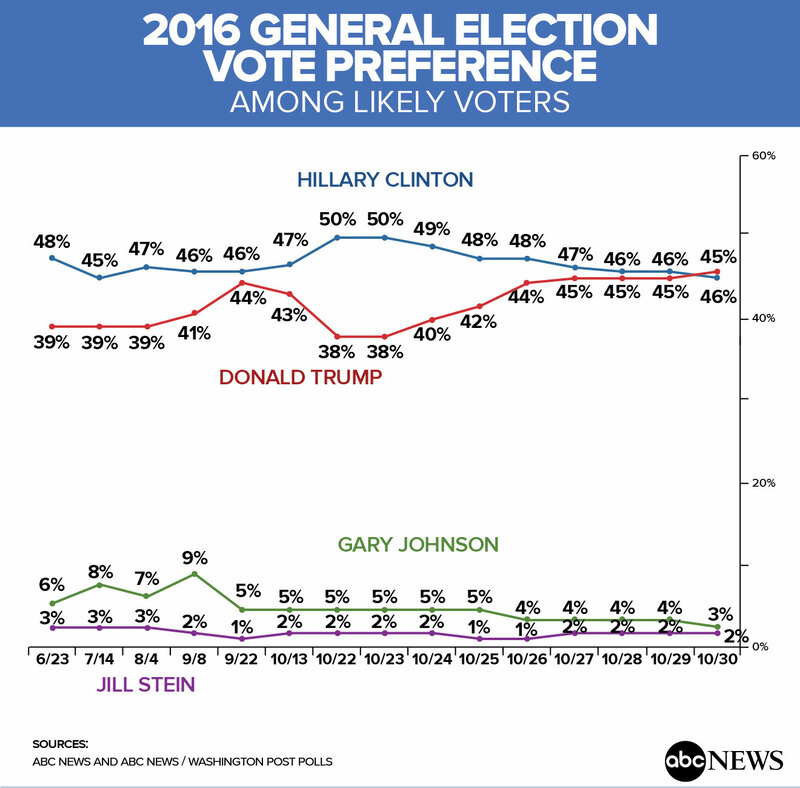 By contrast, the market is positioning for a bearish outcome, even though the polls show that the bullish scenario, namely a Clinton win, as the more likelyt scenario. How would the market likely behave in the absence of tail-risk? How are market participants positioned ahead of the event? What are the likely bullish and bearish scenarios after the event? Mid-week market update: The stock market sold off today on no apparent fundamental or economic news. 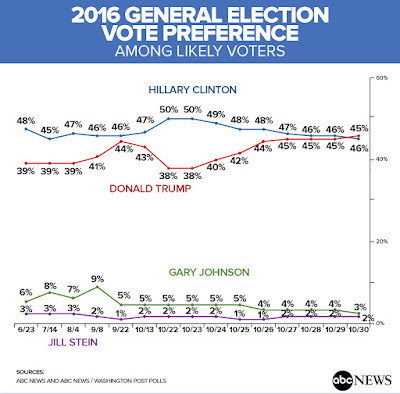 The most likely cause was the latest ABC/Washington Post tracking poll that showed that Trump had overtaken Clinton. The race had been tightening for several days, but this seemed to be the last straw for the markets, which threw a tantrum in response. The Mexican peso, which has been an excellent barometer of the presidential race, tanked as a result. The stock market did too. The SPX has now broken a key support level at 2120 and I am seeing bearish technicians coming out of the woodwork in my social media feeds. The Fear and Greed Index is diving into fear territory.